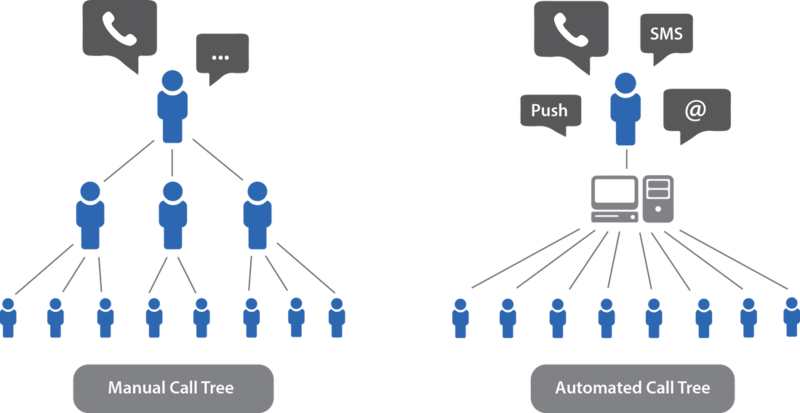 ﻿Discover the power of our multi-channel automated call tree technology on RapidRecall. Human resource is the most important asset for businesses. In any emergency situations, CXOs need to ascertain the safety of all employees and status of the organisation to respond to the events. Time is of the essence during a crisis and any delay or misjudgment in executing an evacuation plan could be detrimental. While manual call trees may work for a staff group of less than 10, the consequences of a slow and non-effective communication system may prove to be costly to businesses. Furthermore, this may not be an optimal method for organisations with a large number of employees as it would be difficult to keep track of all responses. Hence, smart businesses are increasingly choosing automated crisis notification solutions to minimize any error which may lead to costly mistakes. With multiple call-out routes and a retry mechanism, be assured that any potential system failure can be rectified in the shortest time possible. Broadcast to a group and invite them to join a conference call immediately. RapidRecall supports up to 100 people in a call, with 40 local numbers to call in. Within minutes, notify thousands of people on their various devices through SMS, Push Notifications via our free mobile app client, Voice Call and Email. The real-time response statistics along with graphical reports allow management to have immediate assessment of all the staff readiness and make key decisions swiftly.